My current works are based on carved, segmented constructions in exotic hardwoods that are concerned with conceptual ideas and the things that have meaning to me, sometimes with political undertones. For example, my Impact series is concerned with gravity and efflorescence, and the Tower series is concerned with architectural forms, like degenerating nuclear cooling towers or ancient Anasazi round towers. These forms are based on rotated conic sections that I use as three-dimensional canvases to paint with wood and space. My inspirations come from many sources. Leonardo da Vinci had a distinct approach to the creative process. He had a love of the fine arts as well as the sciences, and he was at home with painting and sculpture as well as with engineering and architecture. His work in the sciences and his technical knowledge did not overshadow his creative powers, however. Like da Vinci, I enjoy the sciences and have studied archaeology, cosmology, and mathematics as well as painting, sculpture, and music. Over the course of my career, I’ve built buildings, designed machines, created sculptural furniture, and developed a broad body of lathe-turned artwork. 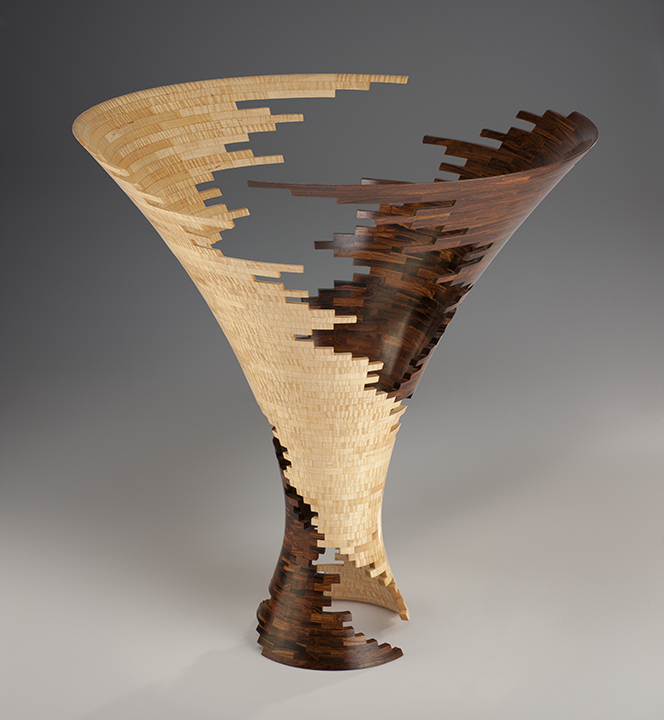 My current body of work uses mathematics and geometry as well as traditional and untraditional woodworking processes. I use computer-aided design software along with algorithmic programming to image my ideas. I can just as easily work on a CAD drawing as put a gouge to a piece of wood or embrace the passion and risk of creating a new form. A love of science necessitates an interest in technology, and the new tools of technology expand the possibilities in art and design. But these tools of technology are only tools. Creative expression is the foundation that underlies and drives the work and is what drove da Vinci to create the Mona Lisa. The hand and the heart are two sides of the same coin, and the modern “tech aesthetic” uses new tools to produce new forms of expression that were not possible in the past. It is my hope that the viewer of my work will sense the sophistication of modern technology as well as the depth of creative expression that underlies each form. Charles H. (Bud) Latven’s career with wood spans four decades, from cabinet and furniture making to lathe-turned sculptures. His work has been shown in a number of gallery and museum exhibitions, including Beyond Boundaries: Wood Art for the 21st Century at SOFA Chicago and Against the Grain: Wood in Contemporary Art, Craft and Design at the Museum of Arts and Design in New York City. Other noted venues include the Saatchi Gallery and Victoria and Albert Museum in London. He has also had solo gallery shows. His work can mostly be found in private contemporary collections as well as the permanent collections of a number of museums including the Center for Art in Wood in Philadelphia, the Museum of Arts and Design in New York City, and the Smithsonian American Art Museum in Washington, DC.